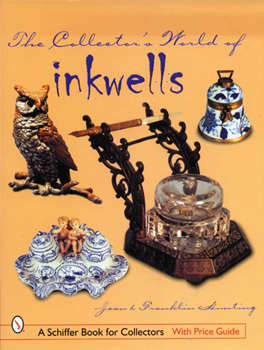 Dimensions: 9" x 11 1/4"
Filled with over 1,000 stunning full-color photos, this book illustrates hundreds of inkwells in all shapes and sizes. Inkwells of porcelain, silver, pewter, cast iron, wood, etc. are all here. Included are exceptionally beautiful and rare examples spanning from the mid Eighteenth century to the early Twentieth century by makers from all over. Each one features a full description and the current market values. Also included are sections on ink, quills and pens, patents, an index, and more. This book is sure to be appreciated by any collector or fan of inkwells, and will prove to be a major source of information.